Lamb Rogan Josh is definitely one of my favourite curries, whether I’m making it at home or getting it in takeaway form. I love the vibrant mix of spices and the melt-in-your mouth lamb, but I also love it because it is really simple to make – or at least my version is! As you may well have gathered from my blog, I am a big fan of curry. I love making it, I love eating it and I really love sharing my curry recipes on the blog. In fact, two of the most popular recipes on my blog are for curries: Roast Chicken Leftovers Curry and my Easy Chicken Korma. 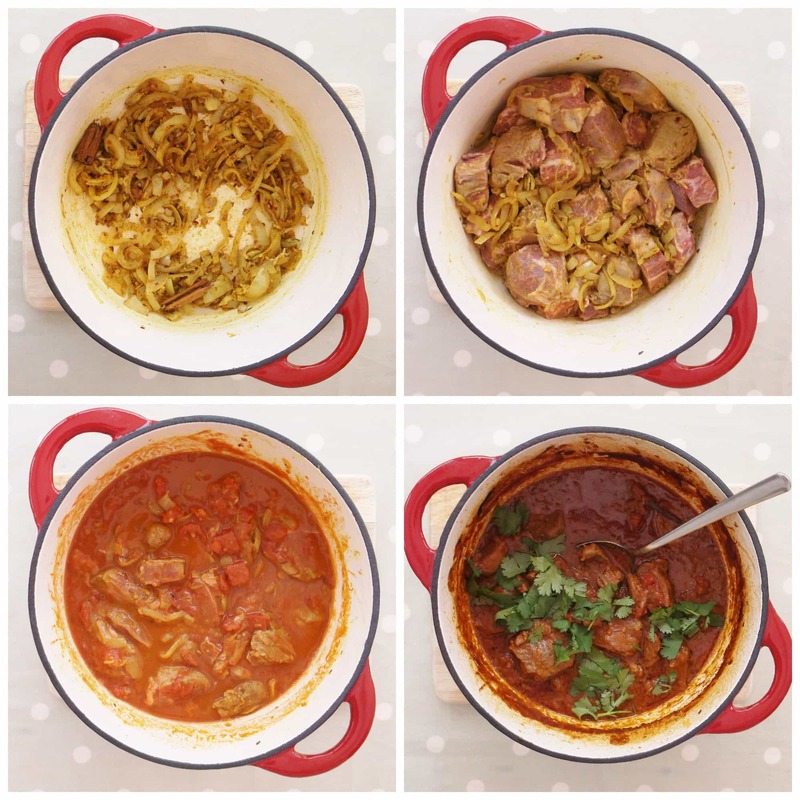 Today I want to share with you my Lamb Rogan Josh and on Thursday I will be sharing my recipe for Easy Peasy Pilau Rice, which would go brilliantly with any of my curry recipes, but goes especially well with my Easy Lamb Rogan Josh. Lamb Rogan Josh is definitely one of my favourites curries, whether I’m making it or getting it in takeaway form (I love cooking, but I do like to take a break occasionally!). It’s also my husband’s favourite curry…in fact it was him who first introduced me to it. I like it because it is not hot (I am a bit of a wuss when it comes to curry, I can’t cope with anything above a medium and sometimes even medium is a bit too much! ), but it is full of flavour and I am a total sucker for slow cooked lamb in any form. I also love it because it is really simple to make (or at least my version is!). …I love Rick Stein’s India, because to make it Rick actually went to India and found out what they really make over there (as opposed to the anglicised versions we often get over here). Consequently his recipes are really authentic, but also often a bit complicated and they often involve hard to get ingredients. The result is delicious (it passed the husband test, you’ll be pleased to hear), but above all simple: fry an onion, add some garlic and spices, add a tin of tomatoes then bung it all in the oven for 1hour and 15mins. Simples! (as those ever so slightly annoying meercats might say). Don’t be alarmed by the number of spices…Yes, it does involve buying a few extra things at the supermarket, but actually putting them in the curry is a doddle…it’s just a case of measuring them out and tipping them in and the result is so worth it! would cost and eye-watering £180!). It’s awesome and I would really recommend getting one if you don’t have one already. Now, my husband would maintain that curry goes best with beer and I would probably agree with him in principle, but I don’t drink much beer these days, so I would choose a red wine to go with my Lamb Rogan Josh. I would go for something gutsy and robust…probably a Rioja Reserva or another similar Spanish wine…I’m really into wines from the Ribera del Duero at the moment…it’s a great place to get Rioja style wines at cheaper prices…I really like Tesco Finest Ribera del Duero Tempranillo Reserva which costs £7. It would go perfectly with this Rogan Josh! Alternatively try a fruity Shiraz from South Africa or Australia. I really like this Zalze Shiraz/Mourvèdre/Viognier from Waitrose at the moment and it goes brilliantly with my Easy Lamb Rogan Josh! Lamb Rogan Josh is definitely one of my favourite curries, whether I’m making it or getting it in takeaway form. I love it because it is really simple to make – or at least my version is! Preheat the oven to 160C / 140C fan / gas mark 3 / 325F. Drizzle 2 tablespoons of olive oil into a wide, deep saucepan or hob proof casserole dish and add the sliced onion, cinnamon stick, bashed cardamom pods and cloves. Cover with a lid and cook on a low heat for 5-10 minutes until the onions have softened but are not brown. Add in the crushed garlic, ginger, chilli flakes, cumin, coriander, turmeric and garam masala. Stir and fry uncovered on a low heat for 3 more minutes. Add in the chopped lamb and stir to coat the lamb in the spices. Continue cooking for a couple of minutes to allow the lamb to start cooking. Add in the tinned tomatoes, 100ml water and salt. Stir and bring to the boil. If you are using an ovenproof saucepan or casserole dish, simply pop the lid on and put it in the oven for 1 hour and 15 minutes. Don’t forget to make some rice 10-30 minutes (depending on your recipe) before the curry is due to come out of the oven. Just before serving the curry, add a large handful of coriander leaves to the curry and stir. Serve scattered with more coriander leaves and with some rice and a beer or a glass of red wine. Enjoy! Fancy trying something new for Easter? Why not check out my other easy alternatives to traditional Easter lamb? I am sharing this recipe with Brilliant Blog Posts, Cook Blog Share, Cook Once Eat Twice, Free From Fridays and Recipe of the Week. My brother was shopping for some new kitchen equipment – pans etc- a while ago, I went to help him spend his money 😉 and suggested an enamel coated cast iron pan like your new one. He wasn’t totally convinced to start with but bought it anyway and apparently he hasn’t stopped using it he loves it that much now! This sounds so easy to make, and the spices in your rogan josh must make it smell amazing as it cooks. I also love making my own curries and have made some fantastic Rick Stein recipes in the past. Luckily I now have a cupboard full of spices so I usually have the ones I need when I make curries but it can be intimidating for someone who isn’t used to it. Thanks so much for linking up with #CookOnceEatTwice! We don’t make curry enough…… Should really change that! This looks like a really straight forward and delicious recipe Eb….. I could quite happily eat the whole (very red) pan full. I like the sound of it not being over hot too….. I’m with you on the wuss front! I just love the colors in this dish. “The husband test”—love it! My hubster was not accustomed to exotic foods at all when he first met me, but he’s become downright ADVENTUROUS. And I LOVE the pan!! I always covet Le Creuset pots, but I just can’t swallow that price tag. I’ll have to check out Waitrose, now that my ancient workhorse Dutch oven is on its last legs. Rogan Josh is an all-time fave of mine, but I haven’t made it for the hubster yet. I have no doubt that he’ll agree it’s fabulous. Lamb Rogan Josh is THE curry my husband always picks when we are having Indian food. He absolutely loves it and yours sounds pretty quick and easy to make too! Thanks for joining in with #FreeFromFridays. Really want to try this recipe but to serve 20. What in your experience do you think I should do with the oven temp and cooking time? Thanks.